There are 119 airports in Illinois for public use. Airports in Illinois are the gateway to a multi-cultural metropolitan America. The Illinois airports use state-of-the-art technology. Illinois' airport systems are the second largest in USA. Illinois attracts people from all over the globe with its booming economy and multi-cultural metropolis. The airports in Illinois are among the top airports in USA. Some of the international airports in Illinois are the Chicago O'Hare International Airport, Chicago Midway International Airport, Quad City International Airport, Clow International Airport, Lawrenceville-Vincennes International Airport and the Chicago/Rockford International Airport. Chicago O'Hare International Airport has almost 40 airlines operating from its premises. It was ranked as the busiest airport in the world in 2005. Some of the prominent airlines are United Airlines, Northwest Airlines, Delta airlines, Japan Airlines, American Airlines, Air France and Air Canada. The airport has many convenience stores, snack bars, restaurants and a full-fledged business center for the time-conscious business people. The Greater Peoria Regional Airport's amenities include wireless Internet, a business lounge, ATMs, two conference rooms, shuttle bus services, restaurants and gift shops. The airlines that operate from the Peoria airport are Allegiant Air, American Eagle, Delta Connection, Northwest Airlink and United Express. One can book one's airline tickets online at the sites of the above-mentioned airlines and receive bonus points for flying with some of them. 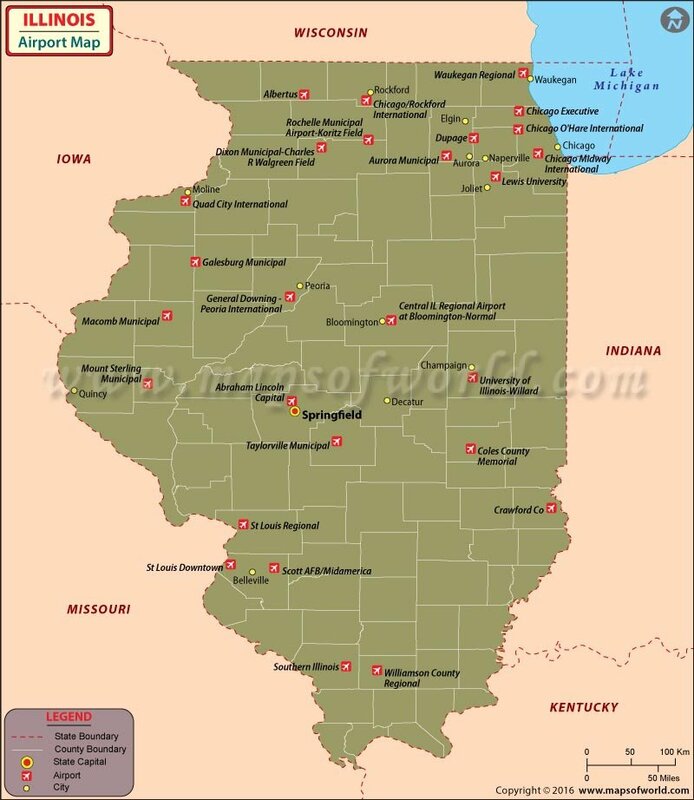 Some of the other airports in Illinois are in Rock Ford, Freeport, Sterling, Aurora, Joliet, Kankakee, La Salle, Moline, Bloomington, Macomb, Quincy, Jacksonville, Springfield, Decatur, Alton, Lawrenceville, Olney, Carbondale, and Harrisburg.